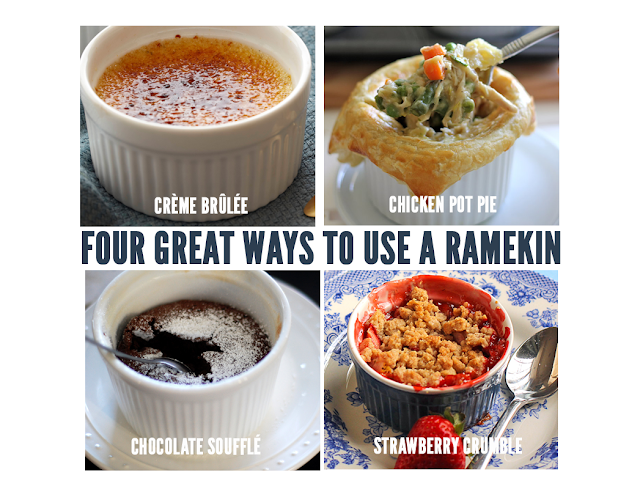 Home » Lessons in Baking » Lessons in Baking - What is a Ramekin? Lessons in Baking - What is a Ramekin? It was a typical Saturday night, only that it wasn't. My friend's big thirtieth birthday celebration was that night. The guys and gals had planned a surprise fancy dinner for our buddy who rarely treats himself out to a nice restaurant. While the main course was a porterhouse steak, it was the dessert that stole the show - a deliciously sweet and well balanced crème brûlée. By the end of the night, the talk was focused solely on the dessert. We talked about how great the presentation was and the incredible taste. What about the presentation? Yes, you guessed it. It was served in a ramekin. What are ramekins or ramequins? The word is from French ramequin, originally a cheese- or meat-based dish baked in a small mold. The French word comes from early modern Flemish rammeken, which meant 'toast' or 'roasted minced meat'. Ramekins are often built to withstand high temperatures, as they are frequently used in ovens, or in the case of crème brûlée, exposed to the flame of a cooking torch. What can you make with ramekins? Use it to make crème brûlées! Quite frankly crème brûlée are not that complex. It is basically just heavy cream, vanilla, and egg yolk. Alternatively, if you are looking to make molten lava cake, you'll need egg, chocolate square, flour, butter, and sugar. Essentially, a molten lava cake is an under cooked cake. Whereby the outside is cooked and the inside is runny. These ramekins make a great gift to those who enjoy baking or otherwise interested in making baking their hobby.